I was first introduced to the subjects of domestication and self-domestication on a car ride from an afternoon screenwriting workshop over the summer of 2017. I’d spent the afternoon in a dimly lit, windowless room — a blank canvas for creatures that were so alive and believable in my mind but refused to materialize on paper. They exhausted and inspired all at once and with the tip of the pen, I drew out the ones that demanded to be seen. In the car that day, I turned on the radio to drown out the voices of worlds undiscovered. A voice boomed through the speaker and drowned out my thoughts. I was in someone else’s world, not a world they had created but one that had been there all along, without me knowing it. The talk featured evolutionary biologist Brian Hare as he spoke of Dmitri Belyaev, a geneticist and Darwinian in Stalin’s Russia who conducted a study on the domestication of the silver fox. Through generations of selectively breeding a captive population, Belyaev noticed not only increased docility, but also unexpected physical changes. The connection was theorized to have its roots in embryonic development. Researcher Richard Wrangham followed Hare to talk about why humans may have domesticated themselves. He spoke of studies on human self-domestication and how it led to the development of early civilizations. I looked into the rear-view mirror and saw a product of evolution. A question began weighing down on me: How has self-domestication shaped the modern-day human? In 1959, Russian biologist, Dmitry K. Belyaev, at the Institute of Cytology and Genetics at Novosibirsk began a study on domestication. In 1948, under Stalin’s rule, the Soviet Union had outlawed genetics research. With the threat of imprisonment and execution, Belyaev cloaked his domestication experiments in the guise of a fur coat factory. He experimented with 130 foxes, aiming to create a genetically-distinct population by selecting for the least aggressive traits and breeding the “friendliest”. The cubs that continued to show reactive aggression after significant human contact were discarded from the population and were made into fur coats. In each selection, less than 10% of tame individuals were used as parents of the next generation. As a result of such rigorous selection, the offspring exhibiting the aggressive and fear avoidance responses were eliminated from the experimental population in just two to three generations of selection. After four generations of selective breeding, the foxes were wagging their tails, and by the sixth generation, they whimpered when separated from their caretakers and were licking human faces. It was in the thirteenth generation that they were tame enough to be adopted as pets (Engelhaupt, 2017). It took wolves thousands of years to become domesticated. By intense selective breeding, it took only a few decades to domesticate the fox in a laboratory. Aside from displaying behavioral and psychological changes, such as decreased sensitivity to stress and increased dependency on social cues (in response to gestures or glances), Belyaev discovered that the domesticated foxes developed a series of physical characteristics that were not present in their wild ancestors. By selecting for less aggressive traits, the animals began to exhibit predictable characteristics resulting in feminization more juvenile appearance. The set of physical traits - floppier ears, curlier tails, shorter canines, smaller skulls, characteristic fur pattern, and shortened snouts and legs - were coined under the term “domestication syndrome”. Charles Darwin, in Variation of Animals and Plants under Domestication, was the first to point out a number of characteristics differentiating domesticated species from their wild ancestors (Leach, 2003). He emphasized the distinctions between human-directed selective breeding for desirable traits, and natural selection - the process in which organisms better adapted to their environment tend to survive and produce more offspring. Belyaev’s results with the foxes were simply an accelerated version of the process of natural domestication of species in the wild. In the absence of selective breeding, it is referred to as self-domestication. Nine thousand years ago, as humans began settling into an agricultural lifestyle, rodents became a greater threat to stored grains. Consequently, cats became increasingly attracted to human settlements in search for mice to eat. The individuals capable of tolerating human proximity and those that reacted to human contact with less aggressive behavior had a selective advantage. They could live closer to the food source and were less likely to be harassed by humans. The symbiotic relationship allowed them to evolve and become domesticated. Studies show that, like all domesticated species, the modern cat possesses genes that lead to less fear conditioning compared to their wild ancestor. In contrast, archaeological evidence of the first domesticated dog, its buried remains found next to that of a human, goes back fifteen thousand years (Engelhaupt, 2017). It is theorized that the transition from grey wolves to the modern dog was, like cats, due to a proximity to human settlements. The wolves were attracted to hunter-gatherer campfires by the smell of meat and left-over carcasses. Individuals with less aggressive traits, higher stress threshold, and less fear response were tolerated by humans, and were thus able to take advantage of resources. 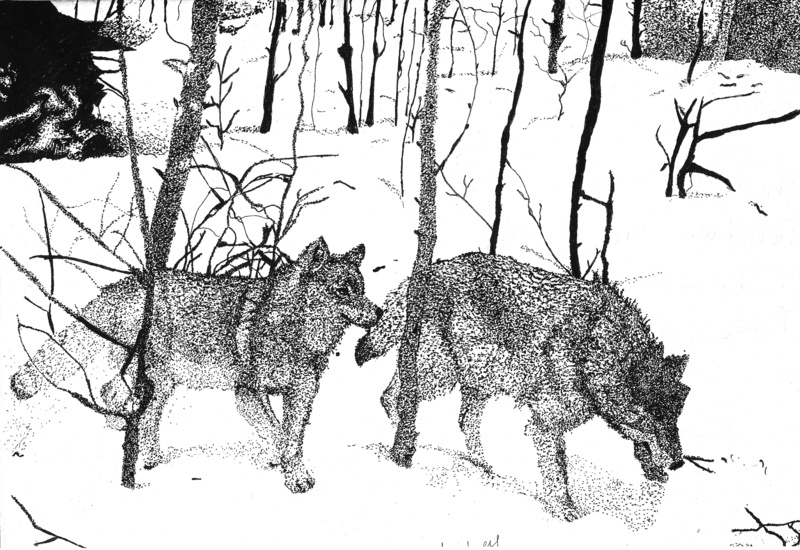 These wolves were more likely to have been able to survive and reproduce. Like Belyaev's domesticated foxes, the domesticated dogs had a series of genetic traits that differentiated them from their wild ancestors: reduction in tooth size and numbers, shorter snouts, floppy ears, and wagging tails. They also displayed psychological changes, including the ability to read human gestures. Perhaps the most famous example, however, of domestication is that of Chimpanzees to Bonobos. Two and a half million years ago, Gorillas and ancient Chimps shared territories spanning from the north and south of the Zaire river (Hare et al., 2011). When climatic conditions forced the gorillas out of the south, the chimps were left with less competition for resources. The change in environmental pressure led to a decreased need for aggression and brute force, conditions suitable for the evolution of the Bonobo. These “domesticated chimps”, like other self-domesticated species exhibit signs of “self-domestication” syndrome. They are slimmer, have smaller skulls and teeth, shorter canines and lighter fur. There are also less morphological differences between the males and females, the adults exhibit more juvenile traits, spending more time engaging in play, and the offsprings are more dependent on their mothers. The Bonobos are also more tolerant of each other, engage in more sexual activity (including high rates of homosexual behavior), are more sensitive to social cues than they are to stress, and are far less aggressive than chimps. Most importantly, they exhibit increased levels of empathy and willingness to cooperate. The self-domestication hypothesis suggests that the evolution of bonobo psychology is due to selection against aggression. By naturally selecting for a less competitive ape, evolution created an animal with the same cluster of traits that humans have cultivated in other species that they have domesticated. Humans, like other species, also exhibit signs of self-domestication. The human self-domestication hypothesis (HSD) states that human evolution was dominated by selection for prosociality, a social behavior that benefits the group as a whole, over individual aggressive behavior. As a result, modern humans possess traits consistent with the characteristics associated with domestication in other animals. The HSD suggests this selective pressure also led to enhanced cooperation and self-control as a result of reduced emotional reactivity to allow a unique form of human tolerance and social cognition to develop. Scientists believe that “self-domestication” was the key to human evolution and discovered a set of linked behavioral and anatomical changes seen in animals that humans have tamed as well as in creatures that have tamed themselves (Gibbons, 2014). Self-domestication in humans resulted in a reduction in reactive aggression—performed in response to provocation—and a greater capacity for premeditated aggression (war, torture, etc). Millions of years ago, human ancestors began to live in closer proximity to each other, relying more on each other and on wider social networks to survive. Sometime in the last 200,000 years, humans began weeding out people with an overdose of reactive aggression (Wrangham in Engelhaupt, 2017), as increasingly complex social skills would have allowed early humans to plan, coordinated, and gang up against violent individuals. Morphological evidence of self-domestication syndrome in humans shows that selection for higher levels of social tolerance led to lower levels of testosterone and stress hormones, especially in males, resulting in facial feminization (Cieri et al., 2014). Like domesticated foxes and bonobos, humans developed reduced jaws, flat faces, and smaller brow ridges and cranial sizes. Studies of DNA show a link between genes that regulate aggression and genes involved in the development of facial shape. A prior study on wolves shows that domestication lengthens the period of development (Gorman, 2017). By selecting for animals that are naturally less fearful and produce less stress hormones, domestication also resulted in animals that develop more slowly. Scientists found that a prolonged period of development favored an exposure to learning that is crucial to domestication, resulting in animals that retained juvenile traits as adults. Natural selection triggered a similar process of delayed development and reduced aggression in humans. As societal ties became more vital for survival, human ancestors began weeding out males who acted with intense and confrontational aggression, selecting for males who could work together (Cieri et al., 2014). Comparisons between apes reveal that only human infants develop cooperative-communicative skills that facilitate human forms of cultural cognition. However, domestic dogs possess certain social behaviors that resemble those seen in human infants. Belyaev’s work with domesticated foxes and the study of bonobos shows how selection for prosociality can lead to increases in the cooperative-communicative flexibility observed in dogs and infants. This comparative developmental work provides the basis for the self-domestication hypothesis, which proposes that a unique human psychology evolved as part of a larger domestication syndrome that converges with other domesticated animals. Over the last thousand years, humans have perfected premeditated aggression (thought out beforehand) and display lower levels of reactive, spontaneous aggression. Most notably, as humans began to manipulate and control their environment, external pressures of natural selection became less important, giving cooperative, less aggressive individuals the advantage when it came to cultivating crops. It was at this juncture that increasingly complex language also began to develop, helping people to organize themselves and giving rise to the first examples of capital punishment. Groups were able to communicate to plan and execute aggressive individuals, creating the framework of early civilizations and making us the cooperative species we are today (Gazzaniga, 2009). Perhaps the most significant aspect of human self-domestication is how the human brain has evolved to thrive within social connections. As humans evolved to become tamer and, consequently, to cooperate, they developed neurological pathways connecting social rejection to physical pain (Banks, 2011). In modern-day humans, a specific part of the brain called the dorsal anterior cingulate gyrus lights up in response to physical pain and social rejection (Banks, 2014). Studies show that isolation is linked to health problems, increasing the risk of heart disease by 29% and stroke by 32%. Isolated individuals are twice as likely to die prematurely than those with an increased ability to connect and individuals with less social connection have disrupted sleep patterns, altered immune systems, more inflammation, and higher levels of stress hormones (Khullar, 2016). The brain also developed a system that allows for the capacity to relate and empathize with others. In 1998, an experiment was carried out on the macaque monkey to study neurons specialized for the control of hand and mouth movement - known as mirror neurons. The researchers allowed the monkey to reach for pieces of food and recorded the neuron's response to certain movements. They found that the same group of neurons responded when the monkey observed a person picking up a piece of food as when the monkey itself picked up the food. The most common theory behind the origin of mirror neurons suggests that it evolved to facilitate action understanding and language (Banks, 2014). Thus, as humans began living collectively, they developed the ability to cooperate and empathize, playing a fundamental role for the development of shared experiences across individuals. As humans developed increasingly complex societies, their ability to connect with one another allowed for the expression of higher levels of cooperation, one that required solidarity. Solidarity is motivated by an individual’s trust in the reciprocal conduct of another in the future; the belief that the other will, in turn, serve the individual’s needs, an aspect of social integration that resulted from and is necessary for increased cooperation (Habermas, 2014). Without solidarity, cooperation would only be possible if it resulted in immediate gratification to all that are involved. A series of studies on chimpanzees has given clues to how such level of cooperation—the foundation of human civilization—evolved in humans. In the first study, psychologists Martin Schmelz and Sebastian Grüneisen at the Max Planck Institute for Evolutionary Anthropology in Leipzig, Germany, trained chimps at the Leipzig Zoo to play a sharing game in which they were put into pairs and given a choice of four ropes to pull, each with a different outcome: give just the player a banana pellet; give just the partner a pellet; give both of them pellets; or forgo the player’s turn and let the partner make the decision instead. Unbeknownst to the partner chimpanzees, the chimp that always started the game was trained to always choose the last option, giving up its turn and risking losing out entirely on the banana pellets. Over dozens of trials, after this individual gave up its turn, its partners pulled the rope that rewarded them both 75% of the time. Therefore, the chimps valued the risk and sacrifice of the individual. Researchers further analyzed the ability of the subjects for solidarity. The team repeated the experiment, except this time when the player passed the turn to the partners, they had the option of either giving themselves four banana pellets and the player none, or giving them both only three banana pellets. The subjects chose the sacrifice option 44% of the time, compared with 17% of the time when the human experimenters made the initial decision. Thus, the chimps frequently felt compelled to reward unselfishness behavior, even at their own expense, especially when directed towards a member of their own species. The second study looked at the motivation for male chimps to risk their lives on “patrol missions” —chimps in the wild often team up and stalk their territorial boundaries in search of intruders. These missions are often costly, as bloody encounters with rival groups can result in injury or even death. Surprisingly, a number of “patrol chimps” have no relation to the group, yet put themselves in such peril anyway. By protecting the group’s food supply and expanding its territory, the entire group becomes more attractive to females and improves the individual male’s chances of reproducing. Such behavior might serve as the evolutionary basis for large scale human cooperation in which immediate gratification is not present within communities (Price, 2017). In 1868—around a decade after publishing On The Origin of Species—Darwin suggested two possible explanations for the cause of domestication syndrome. The first was that the “conditions of living” under domestication, in particular the improved diets provided to domesticated animals, induced sets of physical traits—like those of the domesticated fox. Darwin predicted that domesticated animals released into the wild would lose these traits over time. However, the evidence for such a claim was muddled by the decreased survival rates of domesticated animals in the wild and, in some cases, by interbreeding with wild relatives. The second explanation was that the domestication-associated traits are a product of cross-breeding between related species, one that has been experimentally tested and disproved as the domestication syndrome is present in species that only interbreed as well—like foxes. The most common theory on the underlying physiological mechanism responsible for self-domestication proposes that the domestication syndrome results predominantly from changes in neural crest cells–tissues that are crucial in the development of the skull and pigmentation that arise in vertebrate embryos and ultimately give rise to the development/structure of facial features. There is evidence to suggest that a deficit in these cells contributes to developing physical mutations found in domesticated species. A reduction in neural crest cells alters physical traits that characterize the domestication syndrome. This unified hypothesis states that selecting for tameness leads to a reduction in neural crest cells that results in physical changes. A reduction in aggression and increase in docility—“tameness”—is the most prominent behavioral feature of domesticated animals (Belyaev in Hare, 2012). Domesticated species are characterized by decreased fear in response to threatening stimuli. The nervous system’s adrenal cortex is concerned with stress signals that play a powerful role in domestication. The fear/stress response appears to decrease in domesticated animals and provides a clear link between tameness and neural crest cells, specifically in reduced adrenal production and adrenal size such as was found after 45 generations of selection for tameness in foxes. Domestication thus consistently leads to a reduction in the reaction to stressful stimuli, a direct link to tameness by reducing fearful reactivity. Belyaev also stressed another equally important developmental effect. Domesticated animals have a longer “socialization window.” Under captive rearing conditions, domesticated fox kits were exposed to repeated human interactions before this window closed and the physiological fear response became permanent (Wilkins et al. 2014). This resulted in increasingly feminized faces that differentiate dogs from wolves today. In 1859, Darwin began On the Origin of Species, spending decades collecting examples of natural variation produced through self-domestication, research that was crucial to building his argument for evolution by natural selection. In coining “Survival of the Fittest”, Darwin predicted an increase in aggression as a survival benefit, but evidence indicates that species are actually becoming less aggressive. The Theory of Self-Domestication argues that species are spontaneously (without selective breeding) becoming more domesticated, a process conducive to a set of traits that result in, most notably, an increase in cooperation and innovative social structures. It was not until Dmitry Belyeav conducted the fox experiment that the link between selection for prosociality and a variety of correlating characteristics, including morphological and physiological changes, increases in cooperative communication, and expanding developmental windows, were discovered. The fox experiments led the way for further comparative work in dogs, bonobos, and humans. More recently, Dr. Amy Bank’s study on the development of the human brain further shows us that human beings evolved to connect through studies of mirror neurons and the response of parts of the brain to the stress of physical pain and social rejection. This characteristic allowed for the creation of increasingly complex societies, which are the key to establishing cooperation and solidarity among strangers. The podcast was over. Everything had changed. I turned off the radio and stepped out of the car, catching a glimpse of my reflection in the window. A thousand words rushed to my mind - a thousand creatures. Now, I don’t just see a face anymore. I see everything that came before - the once mysterious forces that shape the way I look and think, the way I see the world and the ways others are portrayed. I think back to my question. What makes us human? Self-domestication isn’t a thing of the past, it is something that is still changing us in the present and will continue to change us in the future. Modernity”, Current Anthropology, vol. 55, issue 4, 2014. Engelhaupt, Erica. How humans (maybe) domesticated themselves. ScienceNew. 2017. Gazzaniga, Michael, “Humans: The Party Animal”, Dædalus, 2009. Gorman, James. “Wolf Puppies Are Adorable. Then Comes the Call of the Wild”. Science. Prosociality”, Annual Review Psychology, vol. 68, 2017. Psychology is Due to Selection Against Aggression”, Animal Behavior, vol. 83, 2012. Jones, Lucy. “A soviet scientist created the only tame foxes in the world”. BBC: Earth. 2016. Touch. The New York Times. 2016. H. Saey, Tina. “Fox experiment is replaying domestication in fast-forward”. Science News. Yong, Ed. “Bonobos-the-self-domesticated-ape”. Discover. 2012.